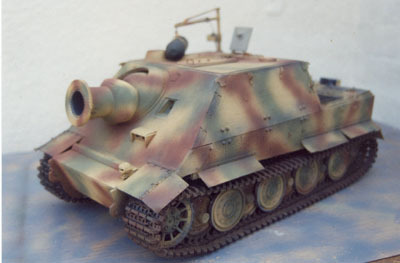 When I was asked to build a large scale model of a Sturmtiger, the first base kit I thought of was the Tamiya one. 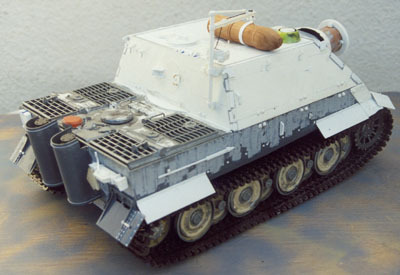 The only trouble was there would be a lot of unused bits over, I knew I had a few parts from a Bandai model that on there own were not much use and some Verlinden Tiger parts. I finally sorted out a Bandai lower hull, drivers plate, glacis plate and track and then a pair of Verlinden exhausts and various small parts. I bought a set of Resin Tiger 2 wheels from a friend and altered the hubs and a pair of resin sprockets and idlers from someone else and we were in business the axles ¼ inch tube with metal rod inners and the body top and fighting compartment from 60th card, the barrel and half ball mount were turned from wood.